This week’s highlighted shirt uses some elements from our other bird-themed shop, Birdorable. The shirt reads Talk Birdy To Me and the cut-outs of the letters are in the shape of Birdorable bird silhouettes. This is great for anyone that can’t get enough of birds. This week’s highlighted shirt is a fresh new updated version of our Eat Sleep Bird design. The previous version had a pair of binoculars representing BIRD, while this edition has an image of a bird hide or bird blind. We show the design here on a one of our newest apparel offerings, the dark sweatshirt. This week’s highlighted shirt is one of our newest: Content Rated B: Birder. This design is inspired by the video game rating system. Wear this funny spoof shirt and let everyone around you know that you are rated B for Birder. Shown here on a Fitted T-Shirt. 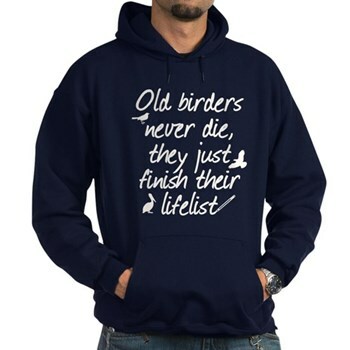 This week’s highlighted shirt is our new design called Old Birders Never Die. We had a version of this design available for sale a few years ago but it wasn’t added to Magnificent Frigatebird initially. Now we’ve updated the design and placed it on a wide variety of apparel and gift items. We show the design here on a one of our newest apparel offerings, the dark hoodie. Some birdwatchers like to keep a life list of all of the birds they have seen in their lifetime. The list is never complete. Well, not until the end. Old birders never die, they just finish their lifelist!